When you are talking with a friend about a product and in the next moment you saw related ads to that product on your device while browsing, how creepy it is? That happened with me and I am not sure Facebook is listening to our voices or not. But it’s better to take action and turn the microphone off for the apps. Just turn it on for the app when you want to use it. There are a lot of stories on social and on print media about the apps using users microphones in order to serve them with the related ads. This is a very weird situation for the users because now apps are recording their personal conversation for their very own purposes. Although Facebook has denied the allegation and stated that it doesn’t use the audio recording for ad-targeting purposes or for any other purpose. This is an unusual situation, whenever you install any third party apps in your phone, they ask you to give permission to access your microphone. Willingly or unwillingly, many users give permission to those apps in order to run them on their phones. When you first installed the Facebook app, maybe you too have given permission to Facebook to access your microphone. Facebook is now listening to my work conversations and suggesting high tech companies for ads. I have never done or searched anything high tech related on my phone. This is ridiculous. Note: one thing to be noted here that if you cut Facebook’s access to your microphone, you will not be able to send audio chat to your friends until unless you re-enable it again. Don’t worry, we will teach you that how to revoke Facebook’s microphone access to your phone. To disable microphone in Facebook app iPhone or iPad you need to follow these steps on your iOS device. Go to Microphone, see if the slider is green. Go back and scroll down to Messenger, tap it. To turn off microphone for the Facebook mobile website when you are using it in the Safari browser on your iPhone or iPad. Just complete these steps. Open up the Settings on your iOS device. Scroll down and look for the Safari app and tap on it. Now, camera and microphone access are also blocked for the Facebook mobile website in the Safari browser. If you are using any other browser for Facebook on your iOS device then to disable microphone simple follow the above steps and in step-2 look for the Chrome app and the remaining steps are same. 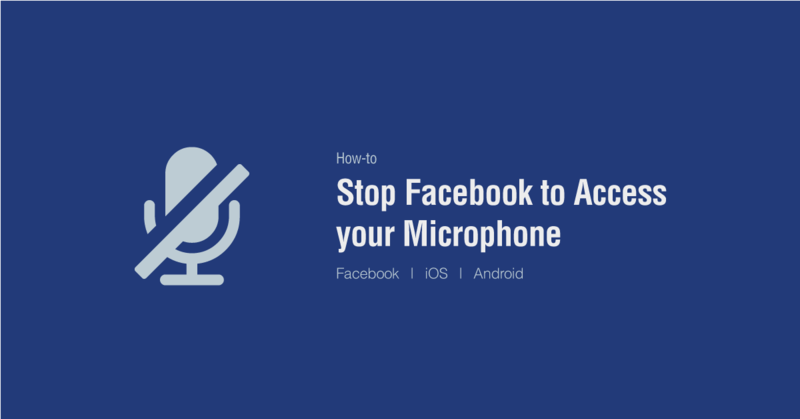 If you are using Facebook app on Android phone and you want to turn the microphone off for the Facebook app. Just follow the given steps below and turn the microphone off on any Android phone. Scroll down to Apps and tap it. From the upper right side of the screen tap on the menu icon. From the drop-down menu, tap on App permission. Find microphone, tap on it. On Windows 10 click the Start button left-bottom corner and select Setting (Gear) icon. Shortkey: Windows+I keyboard keys combination will option the Settings window. On the Settings windows, click Privacy and on the left side select Microphone. Now, on the right side, you will see the list of apps with on/off slider next to each app. For the Facebook app just turn the slider to off position. After doing the steps above you successfully stop Facebook from listening to your voice on the device. To disable microphone access for some other apps, just select a different app (Step-2 for iPhone and Step-6 in Android) while selecting in the settings and the reaming process is same to turn off the microphone.